Touching the wall and winning gold/breaking the world record in both 200m IM and 100m backstroke in Beijing. It made everything I went through leading up to the Games so worthwhile, and to have my family there to witness it firsthand made everything that much sweeter. To make everything that much more amazing, our Canadian S13 women swept the podium in 2 events in Beijing (100m butterfly and 200mIM) – first ever in the history of Canadian swimming, and I got to be a part of both of those sweeps. 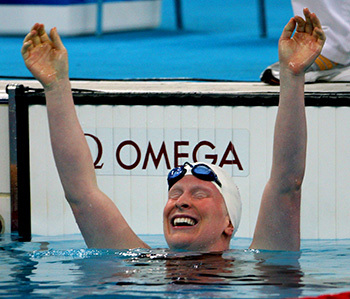 After the Athens 2004 Paralympics, I made the hard decision to leave my family and friends in Nova Scotia to move to Ontario with my coach to pursue my swimming career with the hopes of being the best in the world in Beijing 2008. Although I won medals, including Gold in 100m backstroke in Athens, I wasn’t completely happy with my performance. For the next 3 years I trained 100% with my team at McMaster, and going into Beijing I knew that I had done everything possible to be the best in the world, and if somehow I didn’t win, then the other person deserved it more. Not only did I achieve my goal of swimming the best swim meet of my life in Beijing, but I won 2 gold medals while breaking 2 world records in the process, defending my title in the 100m backstroke, 1 silver and 2 bronze medals. I can honestly say that it is because of funds like the CAN Fund and the support I have received from everyone that I consider a part of “team Chelsey” that my success would not have been possible. I am a Paralympian, and a Canadian Athletes Now Fund recipient. When I wake up in the morning, I have to set my alarm to get up on an odd number.